‘Annunciation’ by Tom Estes, one of the winners of Art Venice 2013, selected by The Biennale Project for The Venice Biennale. The title of the work ‘Annunciation’ is a Biblical term which means the announcing of ‘the incarnation’ or a materialization of the unrealized in a concrete form. The work therefore relates to multiple worlds; possible, fictional or desired worlds which though different from the one we live in, directly influences our own. The Venice Biennale (Italian: Biennale di Venezia) is a major contemporary art exhibition that takes place once every two years and one of the most important dates in the contemporary art calendar. Many are exalting that this years Biennale is not about the conspicuous consumption, materialism and trophy art of recent years. However, a surprise inclusion and debut at this years Venice Biennale may have ruffled a few feathers. The Vatican has chosen to enter the first ever Pavilion of the Holy See, becoming one of the 88 nations to show work at this cacophonous, often irreligious festival of art from across the world. Reactions to the the pavilion have been mixed – from admiration at the Vatican’s willingness to engage with the art world to disappointment that the Holy See, historically the most important patron of art in the western world, has fielded what in some quarters is regarded as a kind of all-purpose spiritual mishmash. 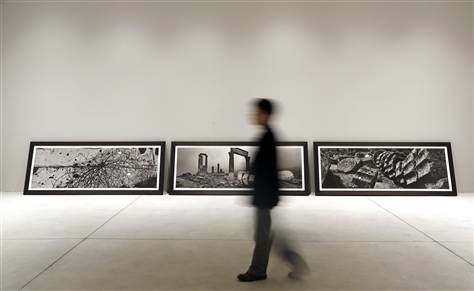 A visitor walks past pictures representing the “uncreation” theme, by Czech photographer Josef Koudelka, at the Holy See pavilion. For some The Vatican should stick to what Catholic Italy does best – quiet churches, free to enter, where glories of Renaissance and baroque art surprise the unsuspecting visitor with feelings of awe and intimations of something beyond this frenetic life. The author of Fides et Forma, an Italian blog on art, architecture and the Catholic church, has written that the money for the pavilion (albeit privately raised) was being “spent on an absurd event” and “an insignificant mental rumination by a few individuals”. Staging the exhibition was “an act of egotism, not of love for the church and Jesus”. Under the headline “A ‘diabolical’ Biennale”, the blogger also expressed concerns that the huge main biennale exhibition – one of whose major themes is mysticism, magic and alternative belief systems – is showing tarot cards designed by the English occultist Aleister Crowley. The Vatican’s presence at the Biennale is the brainchild of Cardinal Gianfranco Ravasi, an exuberant polymath who as president of the Pontifical Council for Culture since 2009 has tried to build bridges between the Church and contemporary culture, two worlds that have often clashed. The Catholic Church’s first pavilion at the Venice Biennale features three rooms of works that take on the themes in turn: interactive videos by the Milanese collective Studio Azzurro focus on creation; then come stark images of man’s destructiveness by Czech photographer Josef Koudelka. Paintings hinting at hope and renewal by American Lawrence Carroll complete the all-male lineup. Installation themed “re-creation” by Australian-born American painter Lawrence Carroll at the Holy See pavilion during the 55th Venice Biennale. 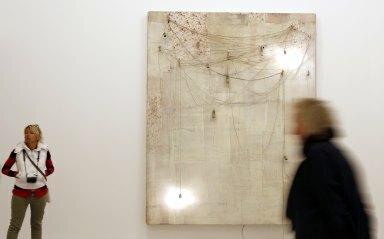 Carroll, who until recently lived in Venice, said he could connect with the theme, as much of his work has dealt with giving new life to objects — a passion that goes back to his childhood when his thrifty immigrant parents would find ways to extend the use of everyday things. Four paintings hang in one room — all large monochromatic canvases in white. One he calls “generically a sleeping painting”; it has a square space cut in the canvas where a folded canvas has been stashed, like a blanket, to be brought out at some point when needed. Another painting is embedded in a block of ice, which melts and refreezes cyclically, a process that continually modifies it. The organisers of the Holy See pavilion at The Venice Biennale deliberately steered clear of work that engaged directly with Catholic themes or imagery. For Cardinal Ravasi, it is very important to distinguish between religious and liturgical artwork and that which engages with spiritual ideas. The Sistine chapel is a church: it contains completely revolutionary artworks but it is still a church. By a thoughtful use of new media, the famous Milanese group Studio Azzurro, have risen to the challenge with an interactive installation. The work shows a person at the centre and stimulates the observer into mental and physical-sensorial movement within the surrounding space and individual and collective memory. Czech photographer Josef Koudelka presents a set of large black-and-white photographs. The panoramic black and white photographs tell of the opposition of man to the world and to moral and natural laws, and material destruction deriving from the loss of ethical meaning. Vadim Zakharov at The Russian Pavilion. Danaë, according to Greek mythology, was impregnated by the god Zeus, who appeared to her as a shower of golden rain. 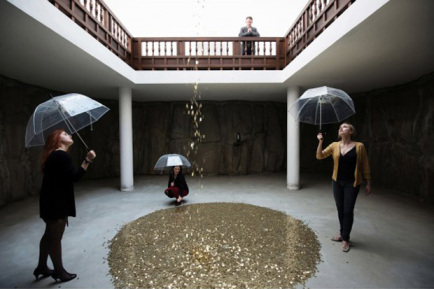 In the installation golden coins rain down into a space were only female visitors are allowed in. The Vatican’s pavilion could well have been a political hot potato since it is devoted to art that is inspired by the book of Genesis – and nothing splits believers from non-believers more than creationism and evolutionism. However Forti said.”It’s very important that the church was to have a relationship with the culture outside: it’s a first step towards both speaking and listening”. Indeed it’s telling that in spite of its title (‘In the Beginning’), the actual art chosen for the Vatican pavilion doesn’t seem to have any direct religious or Christian reference at all. It just seems to be loosely ‘spiritual’. The last meaningful religious art in the west was probably in the late 17th century. Goya for example starts his career in the mid-18th century producing religious works but by the 19th century his work was entirely secular as was practically everyone else’s. 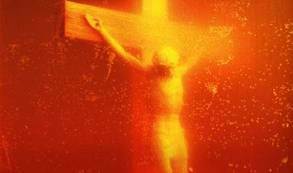 Andres Serrano’s 1987 work ‘Piss Christ’ was recently attacked by Christian protesters in Avignon, France, after weeks of protests. If visitors to the Biennale want a religious moment, they do not need to see whatever contemporary take on Catholic art the Vatican has unveiled, for this city is full of Christian masterpieces that offer a contemplative sacred retreat from the hubbub of the art festival. The Encyclopedic Palace,” as the Biennale 2013 is called, has been organized by Massimiliano Gioni, the Italian director of exhibition at The New Museum in New York. Italy is a Catholic country, but it is also a modern country. So should the Biennale reflect this particular Italian belief? Isn’t it a worldwide art event where all ideas, traditions and cultures are equal? Surely there is no more reason for the Vatican to show art at the Biennale than for the Church of England to run the British Pavilion. However, unlike other religious organisations, The Holy See is a state, recognised as such by the United Nations and in some clear ways in separate existence since the 6th century. So why would one state which has readily been conceded to have an immense artistic legacy, be excluded? 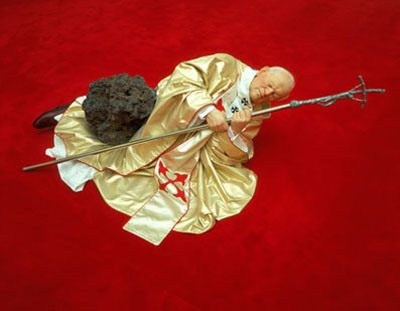 Maurizio Cattelan’s lifesize wax image of Pope John Paul II being struck down by a meteorite, was shown at The Biennale in 1999. We could argue all day about what art is and what it should be. However, the work at the Holy See Pavilion may be beautiful, but it is also bland. However, work like Vadim Zakharov at The Russian Pavilion, and the digital installation ‘Annunciation’by Tom Estes takes religion as a source material and breaths new life into it. Estes' work for the Art Venice 2013, a collateral event in Venice durring the Biennale, introduces a new kind of artwork that functions more as art proposal for a partially realized exhibition; a document of visual and spatial modes of presentation that theorizes a different approach. The title of the work ‘Annunciation’ is a Biblical term which means the announcing of ‘the incarnation’ or a materialization of the unrealized in a concrete form. The work therefore relates to multiple worlds; possible, fictional or desired worlds which though different from the one we live in, directly influences our own. In his practice, Estes creates photographs as documentation of an installation comprised of a video projected on to a book. The work is deliberately left incomplete and the photographs, taken during the works formation, are the only physical manifestation of the original artistic intent. Though the state of being unrealized implies the potential for realization, these project are never intended to be carried out. By intentionally leaving the project unrealized, this has a flattening effect which merely implies the existence of the installation in real-time, three-dimensional space. This closed circuit of illusion mimics and merges with the mass media desire for immediate novelty; anticipating the online reduction of the 'installation' to a single image. However, the selection of the inoffensive works and artists at the Holy See Pavilion is pure politics. I’m personally more inclined to an 18th century definition of art as a combination of the ‘Beautiful and Sublime’. You have to have both to make good art or as the periwigged philosophers would say “Delight that is consistent with Reason” but “mingled with Horrors, and sometimes almost with Despair”. But reason like beauty just doesn’t exist beyond personal delusion. And Art is only at its best when it punctures human conceit and exposes human absurdity within an indifferent universe. The 55th International Art Exhibition is open to the public from 1 June to 24 November 2013 at the Giardini, the Arsenale, and in various venues around the city of Venice, titled The Encyclopedic Palace and curated by Massimiliano Gioni.